DNA is essential for life. It determines the distinguishing characters of each species and controls the growth, development and basic behaviour of all individuals.Thus a major mission of modern science has been to understand DNA and decipher its chemical signature not just for humans but many other species including animals, plants and bacteria. This signature is at one level quite simple as DNA has only 4 chemical parts, which we refer to as A, T, G and C. The complicated part is that these chemicals can be in any order along the strands of DNA, and there are lots of it in every cell! For humans there are 6 billion A, T, G, C’ s in our genome, in 2 copies - one from our mother and one from our father. If each one of these chemicals were the size of a Proton car, just one of these copies would stretch to the moon and back 15 times! Deciphering DNA sequences as accurately as possible is now one of the biggest field of biological and medical science. This is now possible on a scale that was not even imaginable a few years ago as a result of the development of new chemical procedures and new machines. This is called Next Generation DNA Sequencing and is providing valuable and sometimes astonishing new insights on human health and genetics and providing important new knowledge on animals and plants including those of agricultural importance. “Traditionally, gene sequencing was limited to single or few DNA fragments. Older systems were able to only sequence about 1,000 DNA bases at a time, meaning that information provided was so limited that it was virtually impossible to sequence the whole genome,” said Dr Gan Han Ming, a genomics research fellow at Monash University Sunway Campus (MUSC). However, with the recent purchases by Monash University of two state-of-the-art sequencing systems called the Ion Torent Personal Genome Machine and the MiSeq Personal Sequencer, the doors have been opened for much more insightful research into DNA sequencing and large scale projects. Monash Malaysia’s investment in the latest genenomic infrastructure shows great vision. Genomics and the associated field of bioinformatics is now one of the most exciting and fast moving fields of biological and medical-related research in the world,” said Professor Chris Austin, Head of School of Science and Professor of Tropical Biology. Genomics research will lead to important and profound new discoveries including new commercial applications, and is now attracting some of the brightest young scientific minds as students and postdoctoral researchers. So Monash is now ideally placed to become one of the leading Universities in multidisciplinary research and research-led teaching in this dynamic field in the region over the next few years,” he stressed. “Researchers in Malaysia are just venturing into Next Generation Sequencing and the new sequencers will enable us to go very fast and very far in this exciting new field, ” continued Dr. Gan. “Studying DNA and the link to diseases has always been the goal of scientists, but it was not always possible due to technological limitations. It’s always been hard to move forward. Dr Gan, an expert in the use of the MiSeq, said that this instrument has the ability to run rapid parallel sequencing, which not only saves time, but allows researchers to inspect more than just one gene at any one time, making it possible to effectively detect disease markers in the human genome. “In Malaysia, thalassemia is quite a common disease. By just inserting a sample of a person’s DNA into this system, you can tell if an individual has a predisposition to this disease. This is just one example of the many other diseases that can be detected early using this system,” he said. The speed with which it runs is a great feature, said Dr Gan adding that sequencing projects, which would typically take months or even years to complete with the conventional systems, could now take a mere two days! “With this system we are now in the frontline of genomics research for universities in Malaysia because MUSC has recognised the benefits of these systems for supporting ground breaking research. “Internationally there is now such a strong emphasis on Next Generation Sequencing, that if you do not have this technology in your lab, you’ll be left behind” he said. Dr. Gan, whose area of research is in microbiology, said he uses the MiSeq to sequence bacteria DNA, which is less complicated than human DNA. From the data collected, he is able to predict if a particular bacteria strain is virulent or if it’s antibiotic resistant. “If I sequence enough bacteria from an outbreak, for example, I’m able to trace the source of the outbreak as each time a bacteria spreads, it mutates slightly. By sequencing the entire genome, we can easily detect the rarest of mutations and therefore be able to successfully detect outbreaks,” he said. Scientists investigating the recent E. coli outbreak in Germany used the MiSeq system to determine the source of the outbreak, thus stopping the further spread of the bacteria, said Dr Gan. He remains excited about the scope of genomic research that is now made possible at Monash University with its new genomics platform, adding that he currently supports six to eight lecturers and their PhD students on a range of genomics projects. “Because Next Generation Sequencing technology is relatively new, many of our lecturers and researchers don’t have much exposure to the system and they don’t have time to learn from scratch so I’m here to help them,” he said. 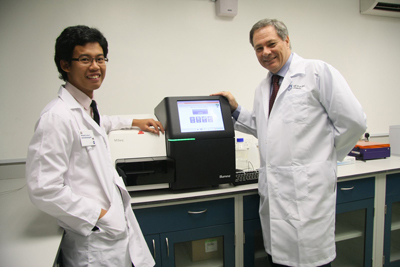 Dr. Gan, who is very well-versed with the functions of the MiSeq following his two-year corporate stint with the sole distributor of the system, said he sees his role in Monash University was very much to enable the use of this new technology to support existing and new research projects. “This system opens a lot of doors for important research into human and animal diseases, viruses, plants and so much more. I’m both excited and humbled to be able to be a part of it, along with the many talented and high level researchers here at Monash,” he said.